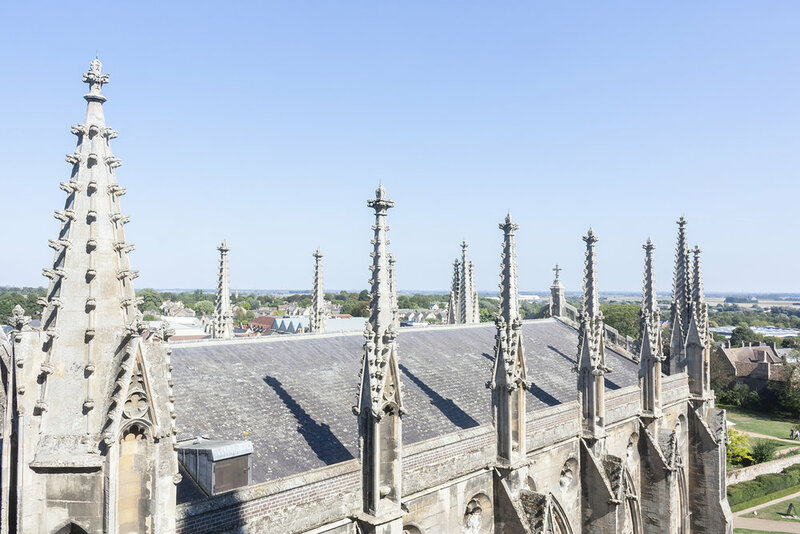 The city of Ely is quite small compared to other cities but this stunning piece of architecture with over 1300 years of history makes a day trip to this picturesque location well worth a visit. One surprising bonus that you very rarely come across theses days was the free car park (apart from very early morning times) that was just a short walk away from the cathedral. The founder of this Cathedral was Etheldreda, the wife of a Northumbrian king who established a monastery on the spot in 673 A.D. The present structure dates from 1081 and is a remarkable example of both Romanesque and Norman architecture. The Octagon is the centrepiece of the cathedral but in 1322 disaster struck as the Norman central tower collapsed. Alan de Walsingham, Sacrist of the monastery, created this incredible engineering masterpiece and you will get right up close in the ceiling and appreciate if far better by taking the guided tour up the narrow staircase. Our guide was so informative and professional and gave an insight into the building that you would really be missing out on if you didn’t include it in with your visit. Tour time takes approximately an hour and you have to be relatively fit to scale across the rooftops once you finish the long climb up the stairs. The guided tower tour which costs £9.50 each takes you inside the Master Carpenter's oak Lantern Tower of huge, wooden beams. The masterful coloured panels, designed by George Gilbert Scott, open out allowing a spectacular view onto the Nave floor almost 40 meters below. Finish the visit off with a visit to the beautiful Almonry Tea Rooms, where you will find the best lemon meringue…EVER! As well as the cathedral Ely offers delightful strolls down by the waterside watching the boats on the Great Ouse River. Until the 17th century, the city was an island surrounded by a large area of fenland.